Tonight, as I watched the Second Night Show, my mind focused on the beauty of trees. The entire camp gathered at the Zaks Amphitheatre as each village staff took to the stage to showcase their talents and demonstrate what makes their village special.. I thought of the thousands of trees on our vast camp acreage and how each tree has its own personality just like each village. I thought of the unique gifts that each camper will share this summer at camp and how each tree shares its own gifts with us. At Tamarack, our campers and staff live on 1,500 beautiful acres of land dotted with trees as far as the eye can see. The campers remind me how important those trees are to our camp on a daily basis. Each village has a chance to plant a tree in one of our lush fields as a way to give back to camp. Before the digging begins, I ask the campers what trees provide for us. Oxygen, paper, fruits, nuts, shelter, shade, and wood for fires are some of the common responses I hear. Some campers have reminded us that chewing gum, medicines, maple syrup, and chocolate also come from trees. 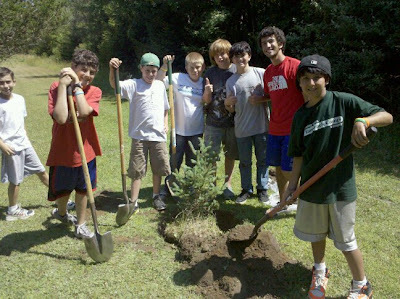 In past years, each camper and counselor has planted an individual tree. This summer, however, as a true sign of community each village will be planting a big pine tree to serve as an enduring reminder of the magic of the summer of 2010. God willing, in the future, the campers will return to Tamarack with their own children to visit the tree they planted this summer. After the campers have planted their village tree we gather in a circle and listen to the personal dedications. Everyone in the village – campers and staff – share the names of the individuals for whom they planted their tree. Some dedicate it to their parents, siblings, friends or pets. Others have planted the tree in memory of a beloved grandparent. Many campers have dedicated the tree to their counselor or their bunkmates. One camper dedicated his village tree to everyone at Tamarack. After each camper fills out a keepsake tree certificate, we join together in the Shehechiyanu blessing, acknowledging how grateful we are to partner with God in making our camp look even more beautiful. This is truly a wonderful way for us to give back to our camp. The website of the Jewish National Fund is listed on the tree certificate so families can plant a matching tree in Israel when their camper returns home at the end of the session. Just as the trees throughout our camp grow and blossom, may our hundreds of campers grow and blossom this summer and may we reap the wonderful gifts they give. Your Idea is great.I think every people should be inspired the kids for tree plan.tree plan is most important for the environment.Thanks for sharing great information with us.